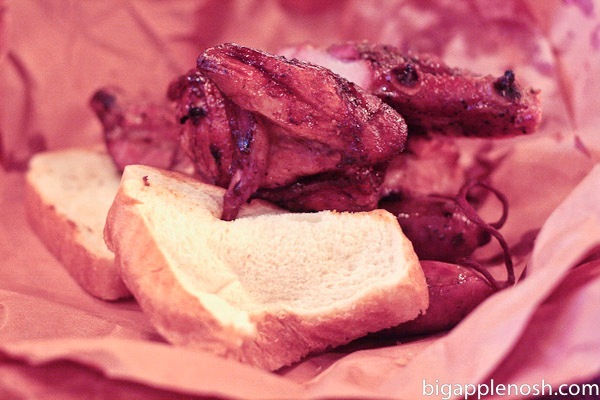 I recently checked out Hill Country Barbecue with a meat-loving eating buddy. Loud, casual and lively, Hill Country Barbecue had a reputation for good meat, good music and a fun atmosphere. But would it live up to its reputation? Eating buddy and I shared an order of “The Pitmistress” (first picture): a quarter chicken, a pork spare rib, cornbread, and a side. We supplemented this order with an extra spare rib, 2 extra sides and the jalapeno sausage. You know, not to get TOO crazy or anything. 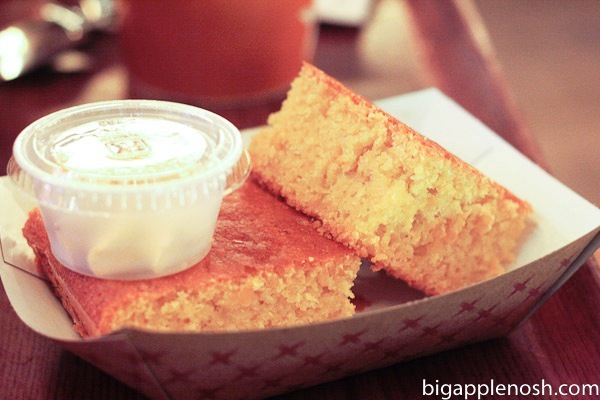 The cornbread was flavorful and just appropriately “corny,” but a little crumbly in my opinion (a common trait amongst many cornbreads, sadly). Not to worry, we still ate it. The meat came with two slices of white bread and sauces were readily available at the table. The chicken was tender and moist, the rib generously sized, and jalapeno sausage flavorful with just the tiniest hint of heat. I think my fave was the chicken. 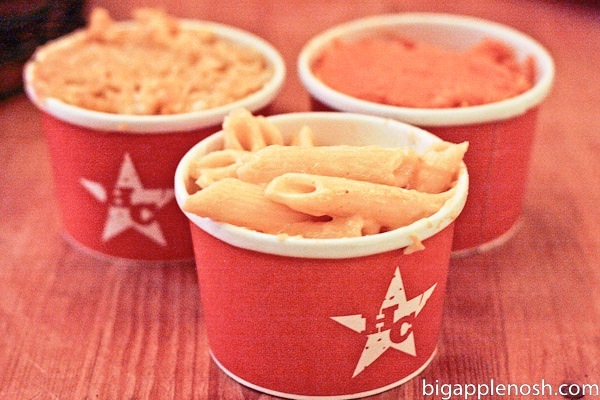 For our sides, we ordered the Longhorn Cheddar Mac & Cheese, the Corn Pudding, and the Sweet Potato Bourbon Mash. I admit that I loved the sides more than the meat. The corn pudding was deeeelish! Highly, highly recommend. The bourbon mash was also quite scrumptious (and it’s good for you….right?) and the cheddar mac & cheese was also a hit. Unfortunately we got the dregs of the last pan of mac & cheese right before they dug into the hot, crispy crumbly new batch right in front of us. What a tease. 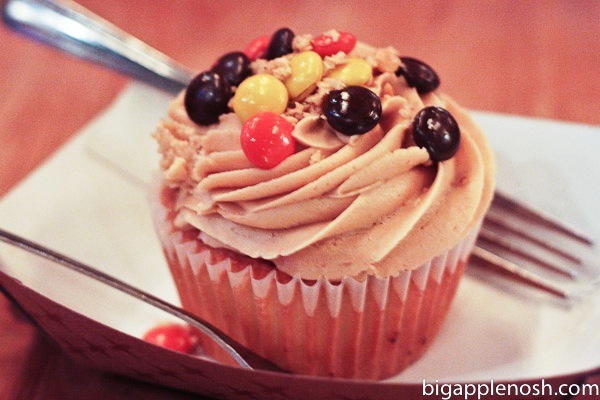 We finished off the meal with the staff-suggested PB&J cupcake. I was a big fan of Foodparc’s PB&J cupcake and was curious to see how Hill Country’s matched up. The most obvious difference was the presence of Reese’s Pieces – a big plus in my book. The frosting was peanut buttery without being cloyingly sweet, and the cake was moist and flavorful. My one gripe would be the jelly center – while it was yummy, there was too little of it! More jelly, please! 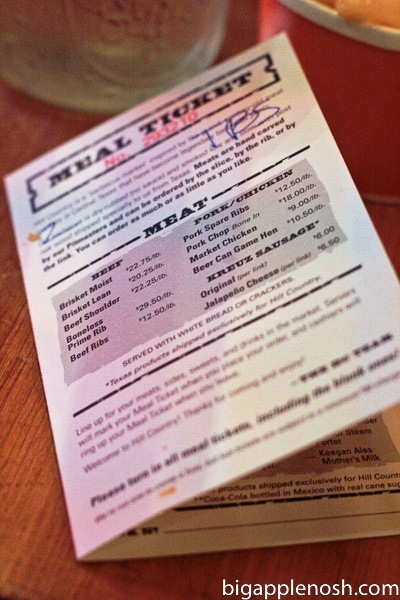 Hill Country Barbecue has a casual dining atmosphere that is great for groups. You can enjoy meat sliced to order, live music, and friendly service. While I actually prefer the sides to the meat, I would recommend HCB for a fun night of food. Great for groups; try the corn pudding! Okay. Note to self: do not read Noshgirl's blog when hungry. OMG want mac and cheese. 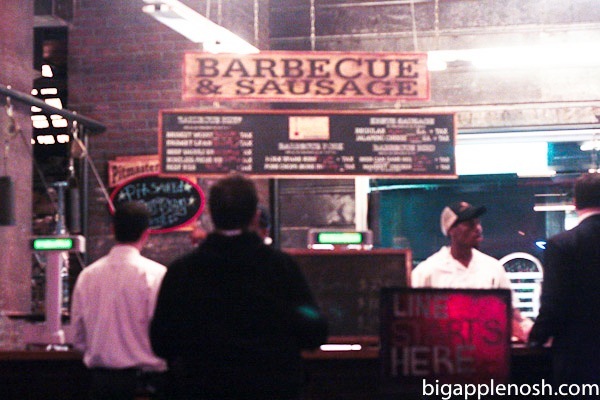 I'm surprised you gave HCB only two apples…I've never been myself but have friends who swear by that place and say it's hands-down the best BBQ place in NY. Could you recommend a better alternative? I completely agree with your HC assessment. We went there once for the all you can eat Monday's and while it IS a whole hell of a lot of meat for a great price (price includes all you can eat sides as well!) I left feeling sick to my stomach because there was just SOOOO much meat. Oh man! 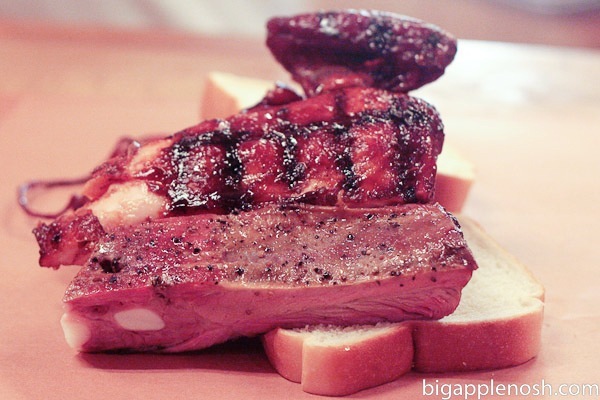 BBQ… *drool* Major props for portion controlling despite the "better value" of all you can eat! I'm with you on the juicier BBQ. Does that mean I don't know bbq? I have no idea. Fun place though! Yum!! Ive been wanting to try sweet potato mash…that looks good! The chicken looks really good too. We actually just had some ribs on the bbq this week at my sister in laws house! Hope you have a great day. Just mmm. I want some corn pudding! Corn bread? Sweet potatoes? Mac n cheese? I've died and gone to carb heaven! Oh wow! Yum! Corn pudding sounds too, too good! You didn't have the moist brisket? That's the best thing on the menu! Hello Anonymous – looks like I'll have to make a return visit!